Glass lid with stay-cool handle. 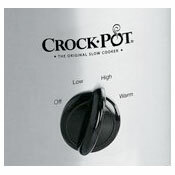 A convenient kitchen companion, this Crock-Pot slow cooker makes it easy to cook up a wide range of menu items. Use it for everything from appetizers and party dips to hearty soups, savory sauces, vegetarian chili, and more. It’ll even hold a 3-pound roast. Its 3-quart capacity nicely accommodates meals for about four people–perfect for smaller-size families or for on-the-go professionals who want easy, healthy meals with leftovers. The slow cooker’s user-friendly design means that both novice cook and experienced home chef alike will enjoy making meals marvelous. To use, simply add ingredients to the removable round stoneware, insert it into the heating base, secure the lid, and it’s ready to go. Three temperature settings–High, Low, and Warm–generate the perfect amount of even, consistent heat for the job. Choose high heat for quickly making meatballs to bring to the block party, or select low heat so the lentil soup will be ready at the end of the day. The Warm setting keeps food at an ideal serving temperature when entertaining–great for parties and buffets. Even more, the slow cooker features a brushed stainless-steel finish that adds a touch of modern elegance to any home kitchen, and its glass lid allows for keeping an eye on food as it cooks without having to remove the lid, so heat and moisture stay inside where they belong. 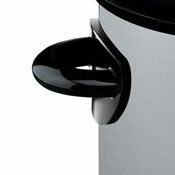 A large stay-cool loop handle on the lid makes it easy to safely remove the lid, while two matching stay-cool side handles on the stainless-steel base ensure a comfortable, secure grip when transporting the slow cooker from the kitchen to the buffet and back again. Integrated side handles on the rim of the removable stoneware also facilitate easy lifting and carrying, whether lifting the stoneware out of its heating base or carrying it to the table for serving or to the refrigerator for storing leftovers (no need to dirty a second container). Best of all, the removable stoneware and glass lid clean up easily by hand or in the dishwasher and recipes come included. 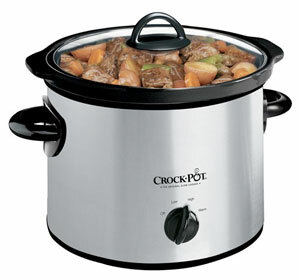 The slow cooker measures approximately 10-3/5 by 8-2/3 by 10-2/3 inches and carries a one-year limited warranty. A 3-quart slow cooker and user manual with recipes.